Following on from the success of our recent paper “Measuring what matters to rare disease patients – reflections on the work by the IRDiRC taskforce on patient-centered outcome measures”, this month we turn the spotlight on cervical dystonia. Cervical dystonia (sometimes called spasmodic torticollis) is a rare disease affecting between 28–183 /million people. It is characterised by involuntary often painful muscle contractions in the neck area causing abnormal movements and awkward posture of the head and neck. Treatments often aim to reduce symptoms, and are typically oral medications and intramuscular botulinum toxin injections. Severe affected patients may need complex surgical interventions, including selective peripheral denervation and deep brain stimulation. In recent years, there has been a steady increase in the evaluation of new therapies for cervical dystonia, including five new treatments since 2012 in seven interventional phase I, II or III studies. In addition, further novel treatments are currently in the pipeline of three pharmaceutical companies. The Cervical Dystonia Impact Profile (CDIP-58) was used in four of these pivotal phase II and III clinical trials in the last five years, as either a primary or secondary outcome measure. The CDIP-58 is also recommended by the International Parkinson and Movement Disorder Society (MDS). The CDIP-58 is a rare example of a legacy patient reported outcome (PRO) instrument developed based on the core methodologies used routinely by Modus Outcomes as part of our concept-driven measurement approach. 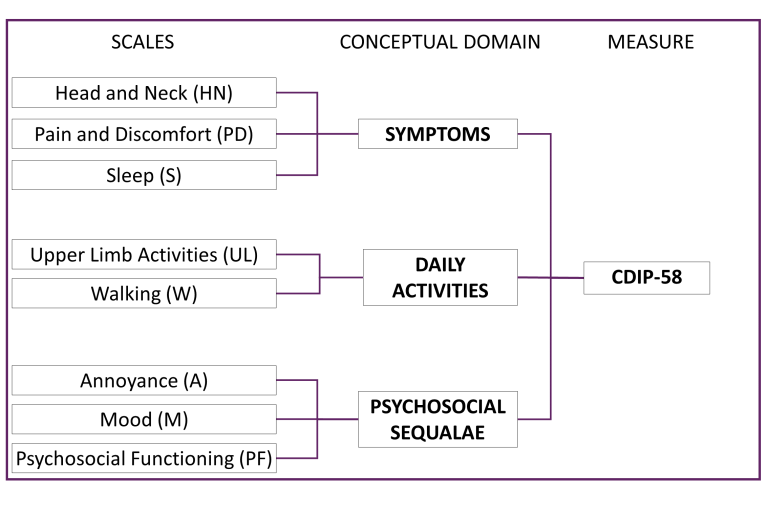 The CDIP includes 58 items grouped into eight independent scales: head and neck symptoms (6 items), pain and discomfort (5 items), upper limb activities (9 items), walking (9 items), sleep (4 items), annoyance (8 items), mood (7 items), and psychosocial functioning (10 items). Each subscale score has a common range of 0 (no impact) to 100 (most impact). The CDIP-58 was developed by Dr Stefan Cano, our own Chief Scientific Officer, together with a team of internationally renowned research neurologists based at the Institute of Neurology, University College London, UK. As the CDIP-58 is a PRO instrument close to our hearts, Modus Outcomes is perfectly placed to support its use in current and future clinical trials. Cano SJ, Hobart JC, Fitzpatrick R, Bhatia K, Thompson AJ, Warner TT. Patient-based outcomes of cervical dystonia: a review of rating scales. Mov Disord 2004;19:1054-1059. Cano SJ, Warner TT, Linacre JM, et al. Capturing the true burden of dystonia on patients: the Cervical Dystonia Impact Profile (CDIP-58). Neurology 2004;63:1629-1633. Cano S, Hobart J, Edwards M, et al. CDIP-58 can measure the impact of botulinum toxin treatment in cervical dystonia. Neurology 2006;67:2230-2232. Cano S, Warner T, Thompson A, Bhatia K, Fitzpatrick R, Hobart J. The cervical dystonia impact profile (CDIP-58): can a Rasch developed patient reported outcome measure satisfy traditional psychometric criteria? Health Qual Life Outcomes 2008;6:58.